This article will be used by teachers who wish to know about the wide variety of features available in School Loop Plus. Important teacher tools are gathered together in a convenient pull-down menu near the top of the screen. Classrooms: The hub for all classroom-related activities where teachers can manage resources, curriculum, classroom news, and preview what students see. Students and parents can access classroom assignments, lockers and other class-related materials here. Gradebooks: Current gradebook for your courses and links to add or edit additional gradebooks (optional feature for School Loop Plus). Groups: All groups a teacher belongs to are listed. It also contains a link to create or join a group. Gradebook (an optional feature for School Loop Plus). This area of the portal displays all teacher's courses for the current school year. When courses are not active (i.e. no students are currently enrolled), they are not visible on the portal. Teachers can access all previous courses and move active sections to old courses via Manage Sections in the Quick Links (see below). 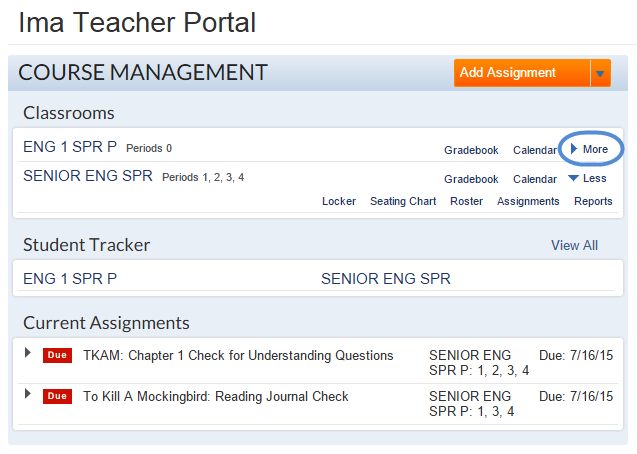 The portal also contains a list of Student Trackers, which are customizable groups of students that allow administrators and teacher to focus on their needs. Teachers are automatically given a course tracker for each course they teach. Student Records: Schedule, assignment calendar, progress reports and more for every student in the school. Parent Directory: Approve parent accounts for your students or view the parent's contact information. Manage Sections: The Manage Sections button also allows you to combine or separate the sections (classes) assigned to you. School Stats: Pageviews, registered parents, teacher posts and more. Classrooms & Websites: Find the classrooms of any teacher at the school. Course Archives: Assignments, progress reports, notes, and course lockers from previous years.